This is the eighth in a series of articles giving brief biographical sketches of the people who owned the Wanstead estate over 800 years. Links are given to sources of additional information on this site and elsewhere. 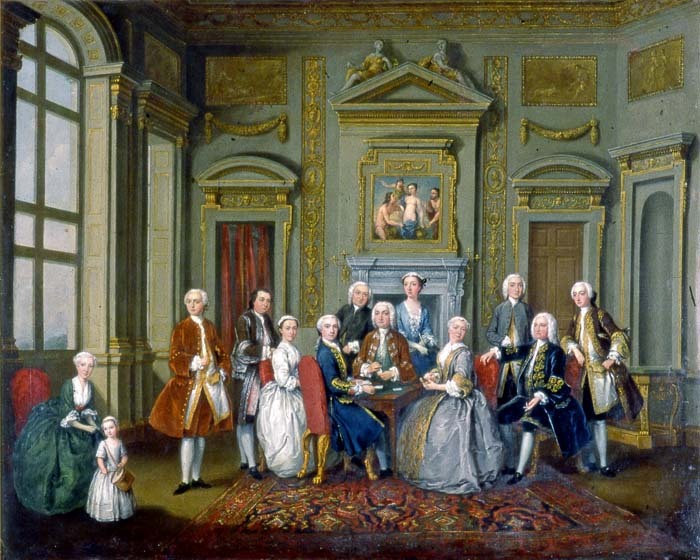 "The Tylney Family in the Saloon at Wanstead House" (1740), by Joseph Francis Nollekens ("Old Nollekens"). Reproduced by permission of Fairfax House, York. "The Tylney Family in the Saloon at Wanstead House" (1740), by Joseph Francis Nollekens ("Old Nollekens"). 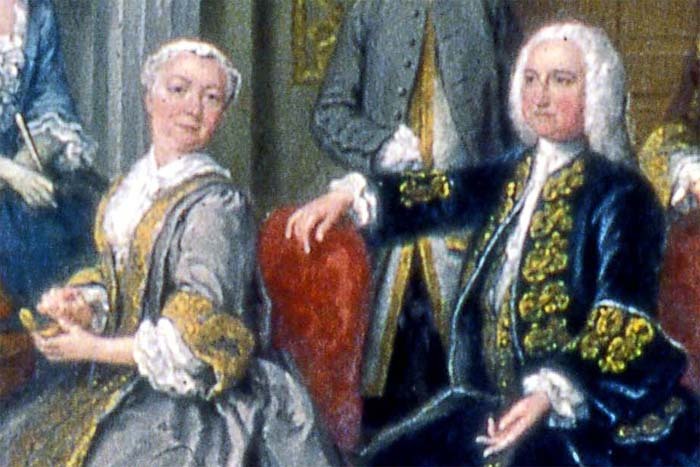 Detail showing Richard and Dorothy, Earl and Countess Tylney of Castlemaine. Reproduced by permission of Fairfax House, York. The death of Sir Josiah Child in 1699, and the publication of his will, resulted in some embarrassing revelations about the state of relationships within the family. Child's eldest surviving son, also Josiah (c.1668-1704), had latterly been out of favour with his father on account of his "disobedience". Although Josiah II succeeded as 2nd Baronet, his father's will left him no more than had been settled upon him at the time of his marriage in 1691. His sister Mary, who had married against their father's wishes, was similarly treated, being left only £5. It was Josiah's younger half-brother, Richard (1680-1750), who had been made their father's principal heir, and it was he who came into possession of the Wanstead estate. Josiah was not destined to long outlive his father. Married to Elizabeth, daughter of Sir Thomas Cooke, one of his father’s East India Company associates, he served as Member of Parliament for Wareham between 1702 and 1704. However, he made little impression in that role and died of pleurisy in 1704. He was buried in Hackney, where he had lived, and where his widow survived him for 37 years. For more information, see History of Parliament Online. As Sir Josiah Child II had no children, Richard succeeded him as 3rd baronet. He also inherited the £4,000 per annum which had been settled upon Josiah for life, bringing his own annual income to some £10,000. He did not maintain his father’s active connection with the East India Company. Like his father and brother, Child was a Member of Parliament and variously represented Maldon (1708-1710) and Essex (1710-1722, 1727-1734) in the House of Commons. He has been described as demonstrating “a certain political flexibility”, which enabled him to make a smooth transition between the Stuart and Hanoverian regimes. In 1715 he completed the family’s journey from its mercantile origins by purchasing his ennoblement via George I's mistress the Duchess of Munster (afterwards Kendal). However, he had to wait until 1718 before he was formally gazetted as “Viscount of Castlemaine in the County of Kerry and Baron of Newtown in the County of Donegal”. The Child family had no known connection with Ireland, and neither Richard Child nor his son appears to have taken up his seat in the Irish House of Lords. However, Irish Peerages had two advantages for an Englishman. Firstly, if the payment of money was involved in their acquisition, they tended to be cheaper than their English equivalents. Secondly, they did not disbar the holder from seeking election to the English (later British) House of Commons. Richard Child’s elevation prompted some grumbling, on the ground that it “was making a man that's no gentleman a lord”. Robert Harley described him as “a jobber” who had “made a prey of the poor”. Interestingly, the Castlemaine title was regarded by some as tainted by its association with the notorious Barbara Villiers, mistress to Charles II, and her cuckolded husband Roger Palmer. In 1731 Child was promoted in the Irish Peerage as Earl Tylney of Castlemaine. In 1733, he assumed the surname Tylney by Act of Parliament, to comply with the terms of an inheritance from his wife's uncle, Frederick Tylney of Rotherwick. Tylney had died in 1725, his property passing to Dorothy Child after the death of his daughter, Anne, Baroness Craven. As far as Wanstead is concerned, Richard Child’s impact cannot be understated. In the early years of his ownership, Child commissioned the celebrated George London to redesign the gardens of Wanstead, in what was to be the last major project the latter undertook before his death in 1714. A set of engravings by Jan Kip and Leonard Knyff depict this scheme. Dating from before 1715 and giving imaginary oblique aerial views to the north, west and east, the engravings show many features which are either still traceable or were confirmed by contemporary accounts. That said, a degree of caution is due. Kip and Knyff undoubtedly flattered the park: for one thing, they show the site as essentially level, which it certainly is not. Their engravings may in part have been worked up from plans which had not yet been fully implemented, and there are possible indications that they may have been influenced in some particulars by the self-aggrandising tendencies of their patron. However, even if some details of the extraordinary garden layout Kip and Knyff depicted were idealised, exaggerated or even invented, there can be no doubt that George London’s vision for Wanstead Park was broadly implemented along these lines. Indeed, its formal framework continues to influence the park to this day. London’s scheme did not last long in its original form. 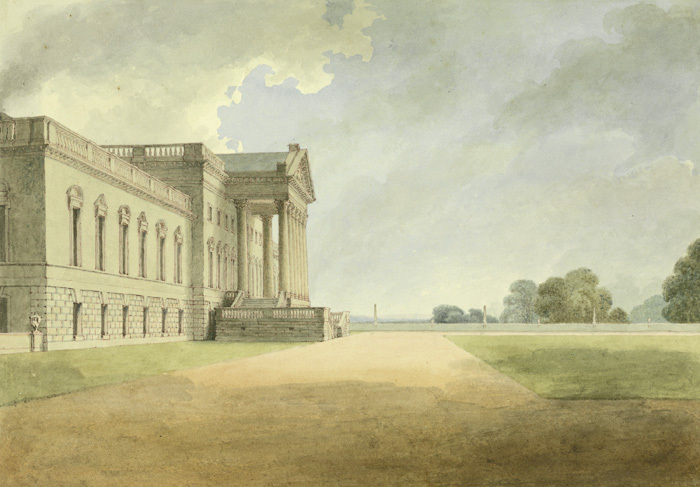 No doubt with the intention of celebrating his new status, Child commissioned the replacement of Wanstead House with a monumental new building in the Palladian style. Designed by Colen Campbell, and later much admired and copied, it was begun around 1715 and completed by 1722. William Kent was responsible for decoration of the state rooms. . The new, Palladian, Wanstead House. Thomas Streatfield, 1807. Yale Center for British Art, Paul Mellon Collection. 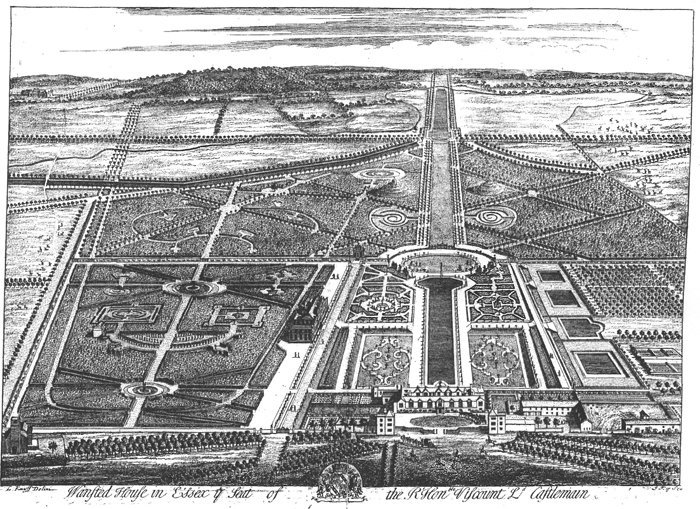 At the same time as the new house was being constructed, the gardens were again radically reordered in line with changing fashions, and perhaps to reflect Child’s newly whiggish political allegiances (architects and landscape gardeners being at that time associated with political factions) Some elements of the less elaborately formal post-1715 scheme, with its focus on a vast new lake system surrounding the house on three sides, appear to bear the hallmarks of Charles Bridgeman and William Kent (a more significant garden designer than he was a painter), even if documentary evidence of their involvement is lacking. Also, there are intriguing parallels between the layouts of Wanstead Park and Kensington Gardens, where Bridgeman, along with Henry Wise, was undoubtedly responsible for the design. Kent was involved at Kensington too - he decorated the state rooms at the palace, and may also have had some influence on the gardens. At Wanstead, a significant role was undoubtedly played by Adam Holt, whose services were retained by Child, and who was a notable nurseryman and landscape gardener in his own right (though one of regional rather than national repute). Wanstead Park’s lake system as it now exists was probably largely Holt’s creation, though he may have been acting with, or under the direction of, others. ...My Lord Tilney had laid out so much on all this that he has barely as much left that he can in some sort support his state, or maintain what he has here erected. This was evident both with the house and garden, which had not been fully completed, because the owner's resources did not allow him to incur further expense. Lord Tilney gave a grand Entertainment at his fine Seat at Wanstead to his tenants and all the Parish of Wanstead, of both sexes, which were about 100 in number; and in the Evening was a Ball, which continued till Two the next Morning. Earl Tylney of Castlemaine died in 1750 at Aix-en-Provence, though his body was returned to Wanstead for burial. Of his nine known children, only one - Emma - left issue, by her husband Robert Long, whose descendants inherited Wanstead after 1784. For further information on Richard, Earl Tylney, see this article and this on History of Parliament Online. With thanks to Dr. Sally Jeffery for the comments she very kindly provided on the landscaping work commissioned by the 1st Earl. A lecture by Dr Jeffery on the gardens of Wanstead is available as a video here and summarised in a PDF download here.